Matthew J. Bryza is a career member of the Senior Foreign Service. He currently serves as the Deputy Assistant Secretary of European and Eurasian Affairs. He previously served as the Director for Europe and Eurasia at the National Security Council in the White House. 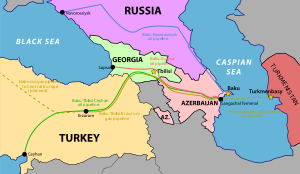 He was also Special Advisor to the President and Secretary of State on Caspian Basin Energy Diplomacy. Mr. Bryza has also served in Russia and Poland. Mr. Bryza received a B.A. from Stanford University and an M.A. in international relations from the Fletcher School of Law and Diplomacy at Tufts University. If confirmed, he would only be the 6th chief of mission to Azerbaijan. He would succeed career diplomat Anne E. Derse who was appointed to the US Embassy in Baku from 2006 until July 2009 (and now US Ambassador to Vilnius).